Beautiful art, beautiful people, beautiful music, beautiful stories, beautiful landscapes, beautiful food, all of it! To just see, hear, smell, touch and taste that which evokes joyous emotion can fill my cup to the brim, and flowing over. It can revive my mind, heart and soul like a mini revolution. Sunday afternoon I retuned to Pacific timezone, after twenty hours of packing followed by travel. I was not well-rested, yet I was revived by the myriad of beauty I had encountered throughout the ten day trip to Italy. Just the day prior, I was walking the streets of Florence. Florence is the birthplace of the Italian Renaissance. I walked through a tour of the Bargello Museum, and took in works by Michelangelo, Donatello, Benvenuto Cellini and more, listening to the history, known of each piece, touching the cool statues, looking into the eyes formed from the stone, with such detail, such affection, with tears in my own. While walking the stone streets I paused to hear two gentlemen making stringed music. As their song ended, I turned to continue on my way, but turned, involuntarily, as their rendition of Pachabel’s Canon caused the tears to flow from someplace so deep inside. In the hot afternoon, I sat in the shade, enjoying the freshness of every morsel of my slice of Italian pizza, while watching a couple dining al fresco, as he lovingly, passionately, kissed her hand, their eyes only able to see those of their lover, both in the seventies. After inquiring about the famous Italian liqueur, Limoncello, the shop owner pulled out a chilled bottle, offering me a taste that, again, tasted of a freshness I had rarely encountered before. I came home utterly exhausted. But my physical fatigue was no match for the overall sense of refreshment. And, as I looked across the baggage carousel, with refreshed body, mind and soul, I was, again, moved to tears, to see my love smiling, beautifully, back at me. And, in the hours that followed, my three other most beautiful ones and I reunited. I worked around my garden last evening, with the bright daylight stretching further with the hands of the clock. My holey, gloved hands covered in the dirt of the Earth, the trees, the shrubs that I touched. Tendrils of my hair, loosened from their elastic, to fall in the middle of my forehead. Muck from the hole that was dug, caked to the bottom of my shoes. Dirt across my pants, from when I ‘cleaned’ my gloved hands. Dirt, dirt everywhere … enough to line the bottom of my bathtub, later that evening. And. it. was. perfectly. glorious. For I was not merely looking at the wonders of Creation, viewing just with my eyes, I was in the midst of the Creation, the wonder, the beauty. I was a part of it, and it was a part of me. If appreciating beauty was simply a visual experience, a picture would fill our cup. True appreciation of beauty requires inspection, not just of it’s outer appearance, but studying it fully and completely. To see the ocean’s edge is lovely. But, to walk, barefoot on the sand, feeling the cool of the water running over our feet, hearing the gulls above, the crashes of the tides, inhaling the fresh salty air … that is to experience divine beauty, from all around us. To speed on a mountain bike over a quaint bridge with a brook running under it is adventure. But, to stop that bike, and hear the symphony of the birds songs while hearing the beat of your own racing heart, and looking at the many shades of green all around, breathing in the most clean scent of fresh rain water falling from above … that is what it is to be united with beauty. May we each have opportunity, this weekend, to become part of a glimmer of beauty, and to enjoy the refreshment and delight that can come from that. 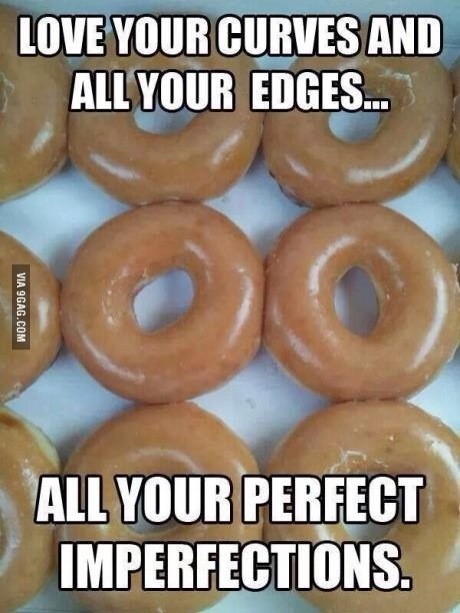 This post actually has nothing to do with donuts. This past weekend I was introduced to a music video that caught my eye and my imagination. I will leave the video with you, to see if it catches your attention too. She also did another video of the same song … I just couldn’t choose between them.